LONG READ: Nine Years of Manipulating a Lake’s Watershed to Mimic Climate Change: More than just a diversion? From creating algal blooms to spilling crude oil and building reservoirs, IISD Experimental Lakes Area is known for big, in-your-face experiments that are highly visible and impactful. The benefit of having visual evidence of the effects of an environmental stressor are undeniable—it’s easier to demonstrate a concept or result when it’s staring you in the face. Left: Lake 226 eutrophication experiment. Middle: Experimental Lakes Area Reservoir Project (ELARP) at Lake 979. Right: Freshwater Oil spill Remediation Study (FOReSt). “See, it never even got a snazzy acronym…”. But what about those projects that are not so easy to see—the ones whose results are more nuanced and take time to develop? 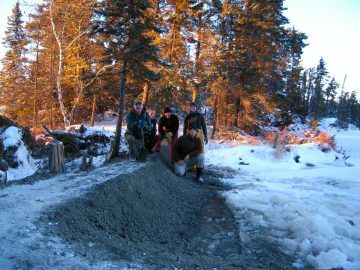 IISD-ELA’s Water Diversion Project (see, it never got a snazzy acronym) involves intentionally manipulating the amount of water flowing into a lake to mimic the impact of climate change and explore the results. Unlike some IISD-ELA experiments that involve chemical additions to a lake, this project was based around a physical manipulation of the landscape. In terms of visual impact, the project is both striking and subtle—the water diversion stream that was created is itself impressive to see (and was even more impressive to create! ), but the actual effects on the lake are much less visible. Given that it is an experiment on climate change, it also relies on long-term study (possibly lasting decades), making it much less visual and immediate than past ELA whole-ecosystem studies. This project acted as an important bridge between our research under Fisheries and Oceans Canada and research under IISD-ELA, and it is still going strong. The Water Diversion Project has been with me through almost every step of my career, and as we move into the ninth year of the project, I wanted to take some time to reflect on what we set out to do, what we have found, and where we plan on going. At its core, the Water Diversion Project aims to mimic a drought scenario in which lake levels have dropped and connectivity between lakes on the landscape is eliminated. When the water level in a lake is higher than the lowest point of land along the lake shore (called the “sill”), water naturally flows out of the lake at this point, typically (in the boreal shield, where IISD-ELA is located) into a stream and then into another lake. 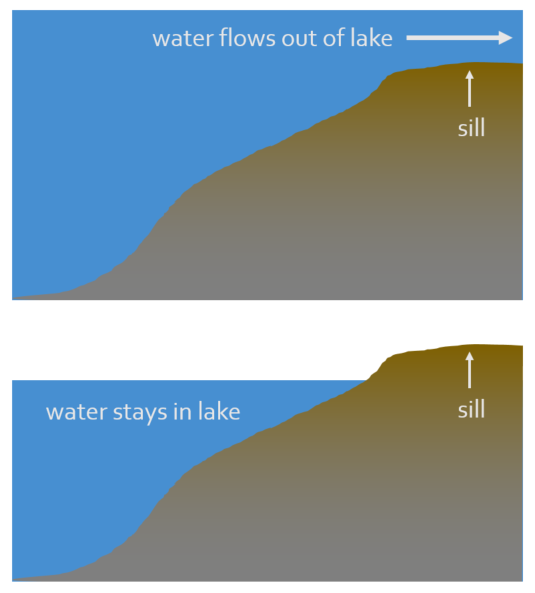 If the water level drops below the sill (because of decreased precipitation, for example) the flow out of the lake will stop and the water will remain in the lake, sort of like water in a bowl. The water in the lake may still be lost to evaporation, and the lake still receives inputs of water from precipitation and runoff from the surrounding landscape, but it no longer contributes water (and any substances dissolved therein) to water bodies downstream. 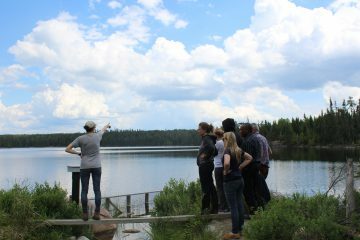 Our Water Diversion Project aimed to mimic a drought scenario to find out what would happen to a lake when it stops receiving water from upstream water bodies—all in an effort to understand what might happen to boreal shield lakes in Canada as climate change progresses. The predictions for this project are well-described in a previous blog post, so I have just briefly summarized them below. 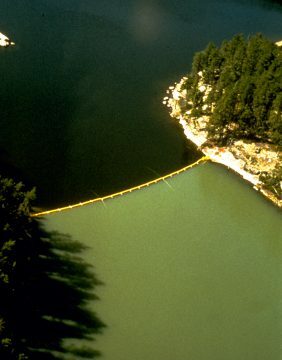 Lake 626 was chosen as the site of the experiment, and to mimic the loss of connectivity between lakes we needed water from the upstream lake (Lake 627) to flow around Lake 626 instead of into it. 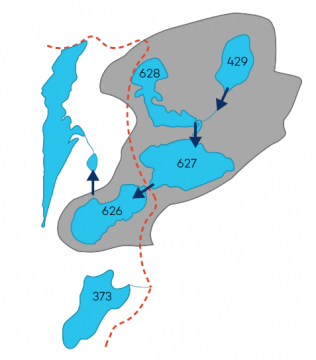 In doing so, Lake 626 went from being a 4th order lake (with three lakes upstream) to a 1st order lake (which only receives inputs of water as runoff from the land around it). To create the water diversion stream, our hydrologist (ELA living legend Ken Beaty) surveyed the route of the new stream and then brought in the heavy machinery to blast the channel with dynamite. Although my history working at the world’s freshwater laboratory extends back to 2005 when I started on the fish crew as an undergraduate research assistant, one of the first field-based tasks I had when I began my permanent job as biologist was to help create the dike that stops water from flowing from Lake 627 into Lake 626, and then to open the water diversion channel, thereby creating a new outflow for Lake 627 that bypassed Lake 626. I’ve said it before, and I’ll say it again—you don’t need a workout program when you work at IISD-ELA! After a few days of heavy lifting, the diversion channel was officially opened on November 26, 2010 and has been flowing ever since. Left: Researchers took two days to create the dike which prevents water from flowing from Lake 627 into Lake 626. 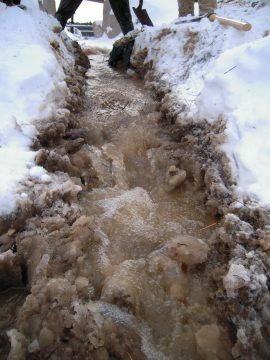 Right: Water flows through the diversion channel for the first time on November 26, 2010. Once the channel was open, we focused on monitoring activities (we had spent three years monitoring before the experiment to establish baseline data), including looking at the thermal structure of the lake, water clarity, water flow, water chemistry, and fish abundance and behaviour, among many other parameters. 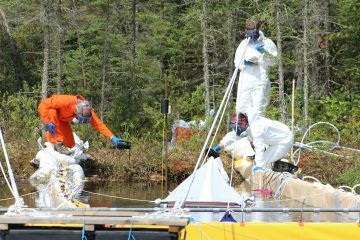 As with all whole-ecosystem experiments, the sampling for this project involves a lot of teamwork to ensure all parts of the ecosystem are covered. 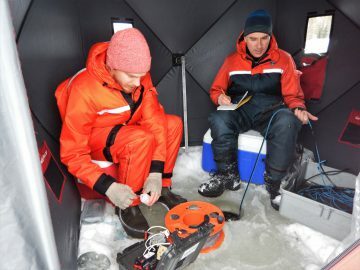 This project has been a collaboration between IISD-ELA researchers and scientists and graduate students from Fisheries and Oceans Canada, Environment Canada, University of Waterloo, Milne Technologies, and University of Toronto. 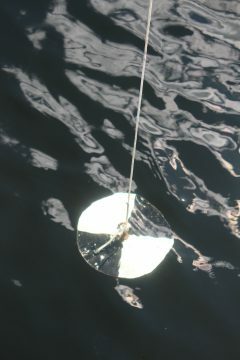 Left: A Secchi disk is used to measure water clarity. 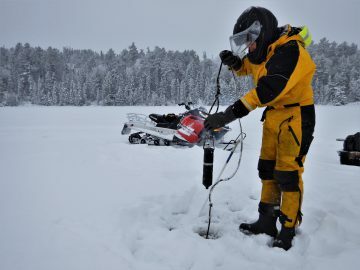 Right: IISD-ELA researchers Paul Fafard (left) and Ken Sandilands measure water temperature and oxygen and collect water samples in winter. As a fish biologist, my involvement in the project has always focused on fish, and particularly on fish behaviour. If the thermocline was going to become deeper, this would in turn reduce the available habitat for cold-water fish (in this case lake trout). 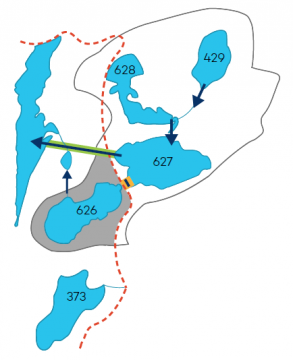 In fact, the main reason Lake 626 was selected for this study was because it was a fairly shallow lake (13 m deep) that contained lake trout (who require cold water) and would therefore be on the “edge” of acceptable lake trout habitat in the face of climate change. In order to study their behaviour and habitat choices we implanted tracking tags into the fish and monitored their movements both spatially (latitude/longitude) and in terms of depth. These tags send out acoustic signals every two to five minutes that are detected by receivers deployed in the lake. We download the receivers every couple of months (yes, even in winter!) to see where the fish are hanging out. 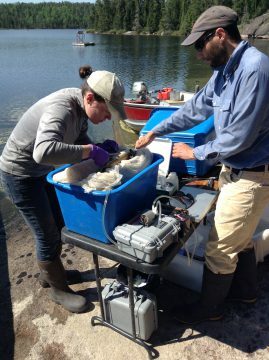 Some of these fish-tracking data have been used to look at how much lake trout use the littoral zone of the lake, changes in lake trout habitat use over time in response to climate change, and to look at lake trout activity levels and feeding patterns. Left: IISD-ELA researchers Lee Hrenchuk (left) and AJ Chapelsky implant an acoustic telemetry tag in a lake trout at Lake 626. Right: Lee Hrenchuk returns a fish tracking receiver to Lake 626 after downloading the data. They say the best way to learn something is to teach it to someone, and one of the goals of IISD-ELA is to educate as many people as possible about our research and field station. 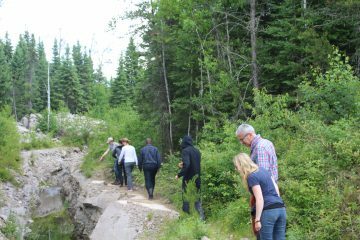 When ELA transitioned from Fisheries and Oceans Canada to IISD in 2014 we were a bare-bones group of just a few research and support staff, and although many of us had been with ELA for years, playing tour guide was a pretty new role for each of us. Given my history with the project, I became what I eventually called the Unofficial Water Diversion Project Tour Guide, and probably averaged a tour every week or two during our first few years. I definitely became more acquainted with the Water Diversion Project as a whole as I conducted more and more tours, and hopefully if you attended one of these tours you learned something too! The Water Diversion Project was never meant to be a quick, flashy project, but rather to be humming along in the background while building up results over time. In 2018 we published what happened to the lake for the first four years of the project! By mimicking a drought scenario in which no water flowed into Lake 626 from lakes upstream, we reduced the total amount of water entering the lake annually from 2,400 mm (stream flow and runoff from watershed combined) to 90 mm (runoff only), which resulted in an increase in residence time of the water in the lake from 2.3 to 18.3 years and reduced the average dissolved organic carbon concentration of the water from 5.8 mg/L to 5.5 mg/L. 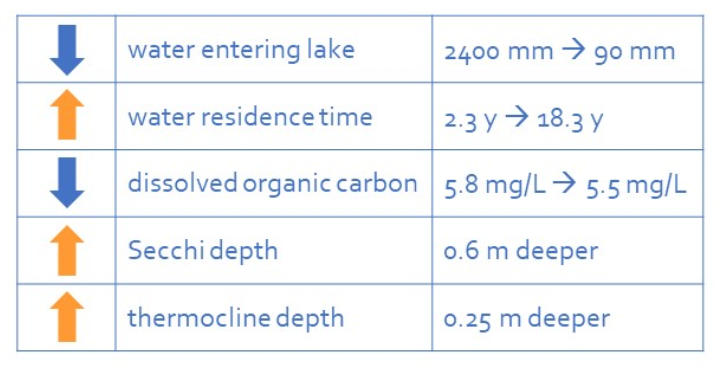 The decrease in dissolved organic carbon led to increased water clarity, illustrated by an increase in the average Secchi depth by 0.6 m, and resulted in an epilimnion that was 0.25 m deeper (thicker). In short, the lake water became somewhat clearer and the upper warm layer of the lake became somewhat thicker. 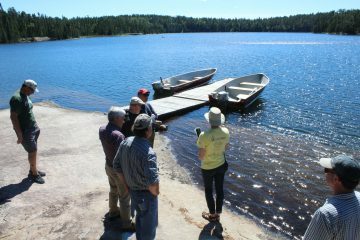 Overall, these findings suggest that the impacts of changes in connectivity between lakes, such as those that may result from climate change, can have significant impacts on boreal lakes. Another interesting result from this project (so far), on the flip side, is the resilience of the system. We changed the hydrology of the system quite drastically (2,400 mm annual input reduced to 90 mm), and yet we did not see any big, immediate changes in the lake itself after the diversion was put in place. The changes we have seen have been much subtler and more long-term, and it will be interesting to see where things go in the next few years. 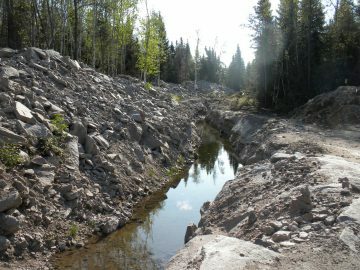 One additional benefit built into the original project was the ability to explore how the diversion channel itself is adapting to its relatively new existence. These types of diversion channels are commonly created in practices such as mining, oil and gas exploration, and hydroelectric power generation, and so we are researching how our own channel is developing in terms of chemistry, flow, and invertebrate populations. Essentially, we want to see how similar it is to a natural stream (and how long it takes to get that way), which is critical information to understand if channels like this can then become viable habitats for fish. 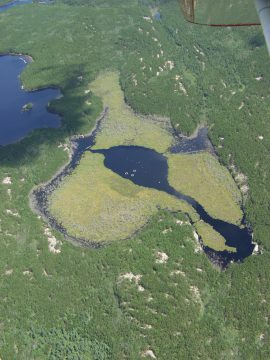 And our research into the impact of climate change on boreal lakes is, unfortunately, destined to become ever more critical, with the effects of a shifting climate being seen ever more visibly and experienced more profoundly by populations across the world. With all of this in mind, our next steps include examining changes in lake trout habitat use, analyzing additional years of light, temperature, and evaporation data, and looking at changes in the diversion channel stream itself, so keep an eye out for more results and publications! 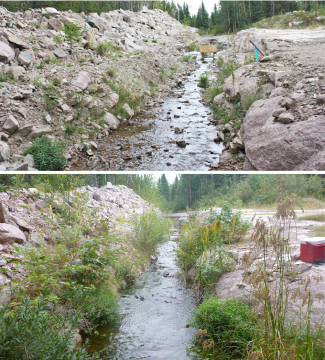 The diversion channel stream shortly after construction in 2010 (top), in 2012 (middle), and in 2015. We have observed increases in vegetation and in the aquatic invertebrate community over time. Future research will involve quantifying these changes to see how similar the channel has become to other natural streams.